and even some drastic miss-translations of the original Russian texts. And, as I have re-noticed lately, [which fact I had forgotten] there are MANY such errors in the old ROCOR printed English texts. before the English texts were put into their final printed form, and sent or mailed out. were not themselves fluent in our spoken and correct English language. Jordanville, was our spiritual center, and so we just must read them, CAREFULLY, being aware of these bothersome human-error deficiencies. When I share such texts, I shall try to proof-read and correct and smooth out the poor English, as best I can, before I share them. machine-translation [Google] from Russian into English, also OFTEN manufactures, which affects and distorts the central MEANING of the texts. And changing the meaning, is a serious fault. but also because of my glaucoma- my poor eyes sight. My apologies I offer IN ADVANCE, to all of my readers. and among the English using Orthodox, there is still ....No ONE OFFICIAL and commonly accepted liturgical English text in use! Thus, we English-speaking and English-praying Orthodox, must suffer the multiplicity of many different English liturgical translations in use. And too, this serious problem also applies to the many divergent English translations of OUR.... ORTHODOX..... HOLY BIBLE, (as THE Holy Bible belongs totally to our Holy Orthodox Church), too. "The memory of the righteous is celebrated with hymns of praise!" On March 25th/April 7th, the Russian Orthodox Church celebrates the 25th anniversary of the mysterious and sorrowful departure from this life of the Holy Patriarch Tikhon. He was elected to the patriarchal throne, which had remained vacant for about 200 years, amidst the tumult and horrors of the October Revolution. These were already symbolic of the conditions under which he had to exercise his difficult duties and responsibilities as head of the Russian Orthodox Church. 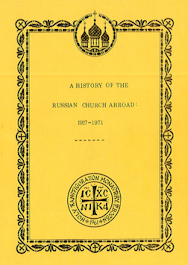 They were also a forecast of the fate of our Church under the new rulers, implacable and fanatical enemies of every religion in general and of Orthodoxy in particular, because of the important part the Orthodox Church had been playing for centuries in the Russian Empire. The newly elected Patriarch Tikhon had to face the first fierce attacks on the Russian Orthodox Church and to deal with them. He did this in full accordance with the commandments of our Lord Jesus Christ and the practice of the Church. He immediately exhorted the Orthodox of the country to stand firm in their faith, and to follow him along the path of martyrdom, if legal means of defending the Church should fail. During the first year of his reign, be anathematized the Bolsheviks. He also had the superhuman courage to enumerate in his first epistle all the crimes and villainies of the red rulers. This he did at the time when torrents of blood were being shed by the Cheka throughout the country. Of course, his uprightness, courage and firmness were duly appreciated by the enemies of the Church ruling over Russia and for a certain period be was kept in jail awaiting a trial, while the sentence of a death penalty was already announced by the soviet press. 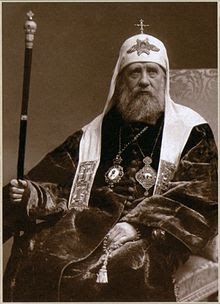 But at that time, the soviet government was not strong enough to dictate its orders to other countries, as it does now, so the interference of the USA, where the Holy Patriarch had spent five years as Archbishop of the Russian Orthodox Church, and the famous memorandum of Curzon, put an end to the imprisonment of the Patriarch. After many months spent in prison, he was released, and immediately resumed his duties. But release from prison did not end his martyrdom, and did not mean that be was not subjected to close surveillance, most painful restrictions, and continual interrogatories by the Cheka. His relations not only with the outer world, but also with his bishops, were complicated to such a degree that often he could not obtain full and true information about some event, although his decisions or instructions on the subject were greatly required. This sometimes led to misunderstandings which were gladly seized upon by his enemies. 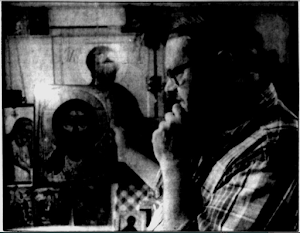 The constant pressure of the Cheka on his mind was a severe added burden to his troubles. One can only wonder at his endurance. The Holy Patriarch had to witness the trials, executions and martyrdom of many representatives of the hierarchy, as: the executions of Metropolitan Vladimir of Kiev, and the famous Metropolitan Benjamin of Leningrad; the deportation of another prominent Metropolitan, Cyril of Kazan, whom Tikhon had appointed as his successor. The Metropolitan Cyril never returned from his exile in the distant polar regions of Siberia. There were hundreds of others. He had to witness the destruction of numerous convents and churches, masterpieces of ancient architecture and most venerated sanctuaries; the execution and deportation of numerous clergy, the closing of all religious schools and theological academies, and the prohibition of religious teaching. In front of the persecution of the Church, he never lost his presence of mind, his firmness, his solid-as-a-rock faith in the invincibility of the Church. The period of his activities, notwithstanding the numerous losses in clergy and church buildings, was at the same time the period of a great religious enthusiasm. An idea of the extent of these persecutions is given by the boastful utterance of the founder and leader of the "Soviet God-less," Emeljan Jaroslavsky. At the celebration of the tenth anniversary of the October revolution, he said that before the revolution there were 200,000 clergymen in the country, while at present there were hardly 20,000. He did not explain what happened to the others. Nevertheless, the period of the Holy Patriarch Tikhon's activities was a period of spiritual elevation. Every Orthodox felt in the persecutions a return to the beginning of Christianity, which gave the sensation of the near-presence of our Lord, together with the foreboding of His Second Coming on earth - this time in glory, to judge mankind and to reward His disciples and true followers. And the Orthodox in Russia made ready to welcome Him with the burning candles of their faith and devotion. A German Catholic journalist who had the opportunity to watch closely the development of events in our country, wrote that, as a consequence of the martyrdom of numerous bishops, clergy, and laymen, a new Church, a Church of martyrs, towers behind the bloody Kremlin. 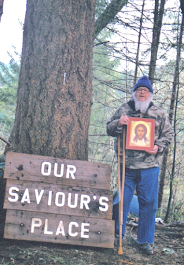 The blood shed by the Russian martyrs will be the seeds of a new Christianity. The suffering will unite Christians throughout the world!